La Dolce Vita is super luxurious and spacious. There’s seven different lounges inside the villa and tons around the property’s exterior. Expect only the chicest decor and most glamorous amenities, plus a full staff to attend to your every need. All nine bedrooms are equally equipped too, so you could easily stay here with friends or family. Ultra luxurious villa on Long Bay Beach! La Dolce Vita sits on the shores of Long Bay with over 430 feet of beachfront. Enjoy the ultimate in luxury with ocean access, onsite staff, and signing privileges at Grace Bay Club. 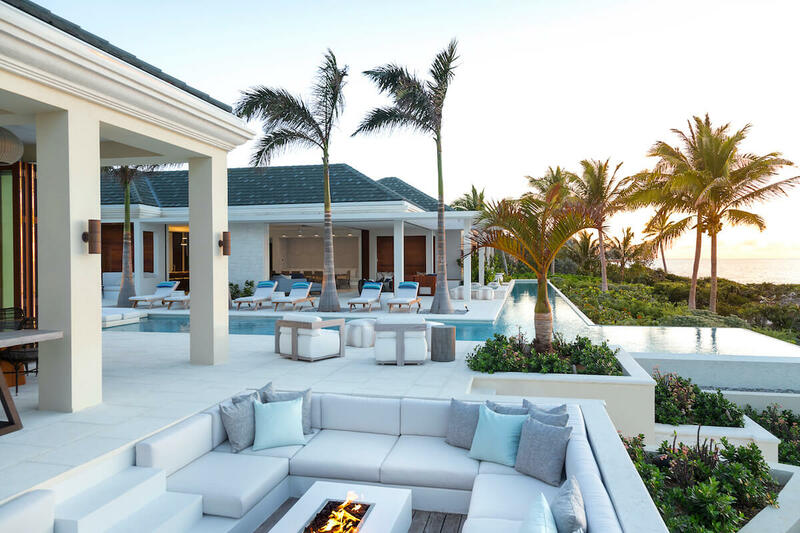 This vacation rental was designed for outdoor entertainment, with a sunken fire pit lounge, two swimming pools, and an abundance of lounging space. Guests can swim laps in the infinity pool or splash around in the garden pool. Columns and archways support the exterior and add to the home’s glamour. There’s tons of verandas with shaded seating and dining, from cushioned chaises to cozy breakfast nooks. The outdoor kitchen has a large stainless steel grill and two wet bars with complimentary start-up drinks. After working out in the fully-equipped fitness center, loosen up in either of the villa’s hot tubs. Sunset views glitter over the horizon every night, and a gardener and pool person maintain the grounds. This gated property comes with daily pool and beach setup, and has paddle boards and snorkeling equipment. La Dolce Vita’s 12,300 square feet living space is designed with modern furnishings and chic accents. The entire interior has air-conditioning and WiFi. The living area has a flatscreen TV and both kitchens have sleek built-in appliances and butler’s pantries. There are four living rooms, three sitting areas, and four powder rooms throughout the interior, so guests can spread out freely. The villa is maintained by a personal butler, housekeeper, property manager, chef, and laundress. Each of the nine bedrooms has an ensuite bathroom with a shower, tub, and vanity. In the main house, six bedrooms have king beds and one has two double beds. One bedroom is upstairs, but the rest are all downstairs. In the guest cottage, there’s a king suite and a twin suite. Long Bay is perfect for water sports thanks to constant wind and a pristine shoreline. Grace Bay is a 15-minute drive away, so guests can easily access restaurants, bars, and activities. Round trip private SUV airport transfers, chef services, (food cost additional) welcome drink, complimentary American breakfast prepared daily in-villa, pre stocked staples throughout the home, complimentary shuttle for dining to Grace Bay Club or West Bay Club, bottle waters replenished daily, non motorized water sports equipment, pool and beach set-up daily, and signing privileges at Grace Bay Club for restaurants, bars, spa and boutiques. Car rental, butler, server, grocery and beverage shopping (pre-arrival and during your stay), liquor and wine delivery, nanny service, baby equipment, spa services, yoga and personal training, and photography can be arranged for an additional fee.